But not enough for Michael to find out who he is and what happened to the world out there. The Great Wave, the Dissolved… are just hollow words in his looted mind. Help Michael face a rotten reality, a universe that’s fading away. Face a merciless world that gets sick and vanishes. Face no past, no present, no future. Face the impending moment of “dead synchronicity”. And you’d better hurry. Otherwise…what will you do when Time dissolves itself? A terrible pandemic is turning all of humanity into the Dissolved – the sick whose deliria provide them with supernatural cognitive powers... but also steer them towards a gruesome death. You will have to help Michael, a man with no past, recovering his identity and decode the events that brought the world to the edge of collapse. Because, if Michael doesn’t hurry, he won’t be able to avoid the impending moment of dead synchronicity... when Time dissolves itself. 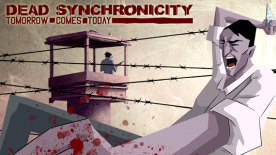 Dead Synchronicity: Tomorrow comes Today is a 2D point and click adventure featuring a script with dystopian overtones. The game pays homage to classic adventures (The Secret of Monkey Island, Broken Sword, Day of the Tentacle...) but revolves around a more mature theme, along the lines of games such as “I have no mouth and I must scream” or “Sanitarium”.